Bead filters are closed pressure vessels filled with millions of small plastic beads. The beads float inside the filter and therefore provide a means of mechanical filtration whilst the vast surface area of the beads provides the biological filration. a very reliable blower! The blower is also equipped with a silencer. 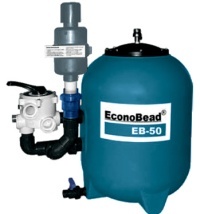 The EconoBead EB40 is suitable for ponds up to 12,000 litres/2600 gallons.